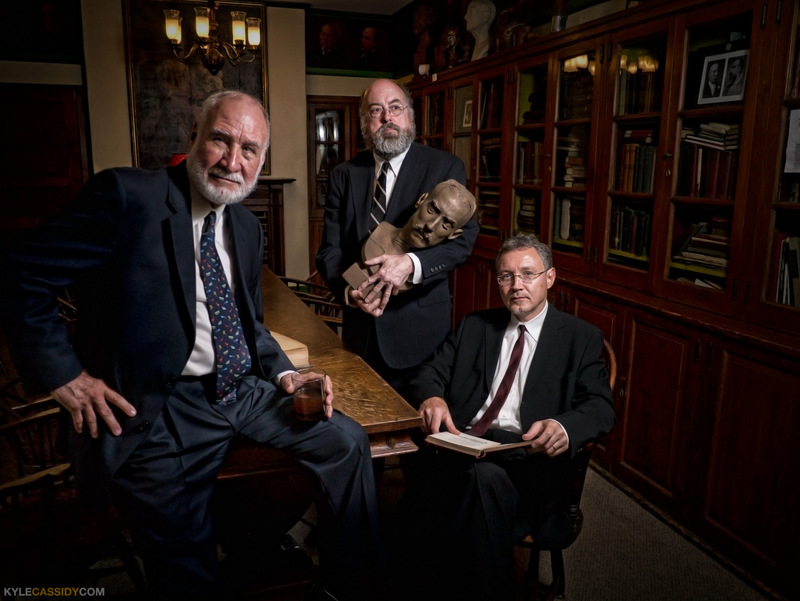 A few weeks ago I photographed three of Philadelphia's most famous artists, Tony Auth, Bill Scott, and Alex Kanevsky, who are being honred at the Philadelphia Sketch Club's 150th anniversary gala. The theme of which is "Mad Men" which is, I believe, a ribbing on the club's origins as "mens only" (today membership is about 50:50, I believe). In any event, all this precipitated me watching about 20 episodes of Mad Men to try and get a feel for what should be going on. (My takeaway, lots of booze, lots of cigarettes, skinny ties.) But we also wanted it light hearted and to reflect the sketch club, which is the nation's oldest art organization and to which most every great artist in the city has belonged for the last century and a half. (The last honoree was Magnum photographer Zoe Strauss, whom I adore.) The club has always existed on a lovely precarious balance between stuffy and whimsical, packed with the most talented painters and engravers who were always doing absurd and ridiculous things. Eventually I started paring down the light, ending up with one 36 inch Photek Softlighter II. I shot it with a Panasonic Lumix GX1 with a 14mm lens, because I'm still trying to make the Micro 43 system work for me. It worked here. We were in and out in about 12 minutes. That's that. I'm off to go running. Perhaps I'll see you at the gala. "Mad Men … of art"
Patron: $150 ($125 is tax deductible) * Art Lover: $100 ($75 is tax deductible) * Artist (Sketch Club members only): $60 ($35 is tax deductible) * The first 150 ticket purchasers will receive a two volume set of books on the Philadelphia artist and Sketch Club Member Peter Moran entitled Domestic and Wild: Peter Moran’s Images of America by David Gilmore Wright (retail value $120 – limited one per household). Cocktails, Buffet, Dancing, Madness - 1960′s “Mad Men” attire is optional. Tickets are available now by calling 215-545-9298 or by sending a check payable to the Philadelphia Sketch Club, 235 S. Camac St., Philadelphia, PA 19107.
aw, thanks! this one took a bit to come together, but once all the elements were included, it went well.